Explosion Proof Traffic Light - Class 1 & Class 2 Signal Stack Light - Red, Yellow, Green - 1.5" GRC(-12/24VAC-Steady Burn). 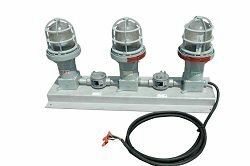 Made in the USAThe EPL-TL-3X10W-C-1.5GRC Class 1, Division 1 and Class 2 Division 1 LED Traffic Light from Larson Electronics is also approved for use in wet locations and marine environments. This waterproof LED equipped light is designed for routing traffic in industrial refueling stations and process status indication in manufacturing facilities.The EPL-TL-3X10W-C-1.5GRC explosion proof LED stack light is an ideal indicator lighting solution for for industrial refueling stations and manufacturing facilities. The light housings are constructed with a polyester powder coated, copper free aluminum casting, that can withstand 1490 pounds PSI hydrostatic pressure. The mounting plate is also made from aluminum and features a 1.5" GRC for overhead suspension mounting. This explosion proof red, yellow, and green indicator light has a 50,000 hour operational life and is available in 120-277 VAC and 12/24 VDC or VACconfigurations for standard or low voltage operation.Click Image to EnlargeThis explosion proof LED light carries a T3C temperature rating and has a -40C to 85C operating temp range. The EPL-TL-3X10W-C-1.5GRC is Class 1, Class 2, Class 3, Division 1 approved. Power is provided by individual conductors to allow independent operation of each lamp, making this unit ideal for fuel depots and manufacturing facilities where status indicators are necessary.This explosion proof fixture is configured for red, yellow,and green output (one lamp each color) offers exceptional lumen output, a 50,000+ hour life span, and the lamps are protected by Pyrex globes and cast aluminum globe guards for added durability. The LED lamps in this stack light are 10 watts each with a 1050 lumen outpur and offer cool operation and clean, bright output that surpasses that of 100 watt incandescent indicator lamps.